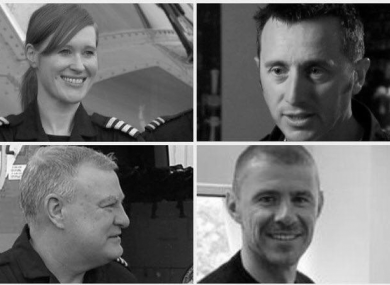 (Clockwise from top left) Captain Dara Fitzpatrick, Captain Mark Duffy, winchman Ciarán Smith and winch operator Paul Ormsby. THE IRISH COAST Guard has thanked in its end of year commentary the various people and bodies that assisted in search and rescue efforts after the Rescue 116 helicopter went down earlier this year. In a statement, the Irish Coast Guard thanked all of the people involved, and expressed sympathy with the families. “The Coast Guard has thanked the general public, and the many statutory and voluntary bodies that assisted with the search for the crew of R116 following the shocking accident that occurred off Blackrock Co Mayo on the morning of 14 March 2017, resulting in the loss of all four crew,” the statement reads. The Coast Guard is mindful of the devastating pain and loss that is felt by the Fitzpatrick, Duffy, Smith and Ormsby families and also acknowledges the resilience shown by helicopter crews, staff at the marine rescue coordination centres and volunteer teams in working through the loss while continuing to deliver maritime Search and Rescue and other services to the wider community. Captain Dara Fitzpatrick, Captain Mark Duffy, winchman Ciarán Smith and winch operator Paul Ormsby all lost their lives after Rescue 116 went down. Fitzpatrick was discovered soon after the incident and was pronounced dead in hospital. The body of Duffy was later discovered in the wreckage. The bodies of Ormsby and Smith have yet to be recovered. In its end of year review, the Coast Guard said that it coordinated some 2,500 incidents this year through its three Marine Rescue Coordination Centres based in Valentia, Malin and it’s Dublin-based headquarters. This was slightly down on last year. Of the people assisted, a total of 335 were categorised as ‘lives saved’. This means that the intervention prevented loss of life or severe risk of loss of life. In total, 3,316 people were assisted this year by the Coast Guard. The service also assisted with the recovery of 65 bodies as a result of drownings and other missing person searches, a 30% increase on the previous year. There was a slight decrease in the number of kayaking incidents – with 37 this year compared to 45 in 2016. But this year saw two people die related to kayaking. Surfing incidents accounted for 24 of all recorded incidents, while deep-sea diving resulted in the loss of two lives, with the Coast Guard coordinating 15 diving related incidents this year. The Coast Guard concluded its end of year statement by reminding people to observe basic safety when engaged in any water-based or coastal activities. If you see anybody in trouble or think they are in trouble on the sea, coast, waterways or on cliffs; call 112 and ask for the Coast Guard. Email “Coast Guard says it's mindful of 'devastating pain and loss' felt by families of Rescue 116 crew”. Feedback on “Coast Guard says it's mindful of 'devastating pain and loss' felt by families of Rescue 116 crew”.